Greetings from the great state of Florida! Allow me to introduce myself, I’m Jadey Dragon. The newest music/live singer critic for SLE. I use the word “critic” as opposed to reporter, because I want to be sure to clarify that within my reports you will get an honest opinion. That isn’t to say other reporters don’t give theirs, but let’s call a spade a spade, most reporters of live music, be it DJ or live singer, write fluff pieces. Using nothing more than excessive adjectives to cover up the bad experience they received. That won’t happen here folks. The report will be raw, descriptive, and hopefully encourage you to take the dive, and experience it all for yourself, if for no other reason than to prove me wrong. I triple dog dare you! Having said all that, let’s get to our first review. 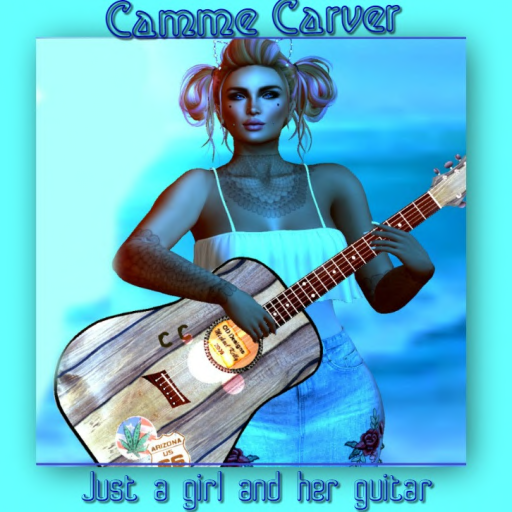 C C (Camme Carver)- Live, Acoustic guitar playing, singer. I feel the need to immediately point out that this wasn’t a woman with a backtrack drowning out the sound of her own voice. Although she was rather low in volume, make no mistake she was playing her guitar live! She’d occasionally tune her guitar as she spoke to the crowd which of course is a dead give away. She was personable, and quick to thank her supporters every chance she got. But those are minor details. I started my review by reaching out to her manager ‘Bad” and asking for a bio. Let’s be real, it was thrown together and offered very little insight into what I was about to experience. I tossed the notecard and the conversation aside and sat back to experience it all as nothing more than a concert-goer. The first note arrived with force, and I was immediately reminded of the Great, legendary, Linda Perry from 4 non-blondes. So I was pleasantly surprised to find “What’s going on” in her song list and wasted no time requesting it. Yep, CC nailed it, despite the rumbles in the crowd of having a cold, she delivered the song beautifully. As she did with most of the songs she tackled. There were a few songs that didn’t arrive to the same level as the first, but I think that might have been more an equipment issue, than a performance issue. You be the judge. I would personally categorize her music as indie rock, but that’s more based on her voice than her song list. She claims to be able to reach the soulful depths of music like Fleetwood mac, to Nelly Furtado, which is quite confusing when you’re attempting to put her in some type of genre. However, I think that’s part of her charm. “CC is one of the most beautiful caring women I know in SL. He voice stands out to me because she is so down to earth, always has a smile and is genuine” Stated Anastasia Yanwu, a self proclaimed fan, and friend. In fact, every single person I spoke with in the crowd was quick to tell me that not only is CC a great singer, but she is kind, humble, and down to earth. So the occasional notes she missed, and yes there were a few, made no difference to them, or me for that matter. You wanted to see her succeed as her personality erupted with every note, good or bad. Stoney Nider, another fan and friend said to me “she has soul and emotion in her songs” and I couldn’t agree with him more. CC wasn’t just standing there collecting coin going from cover to cover without emotion, she made you feel every word. Her delivery felt personal, and story-telling rather than karaoke, which alone makes her stand out in SL. So I conclude giving Camme Carver a strong 8 out of 10, losing points for volume and clarity of her equipment but gaining points on her performance and emotional connection with the crowd. Rock on my sista, Rock on! !